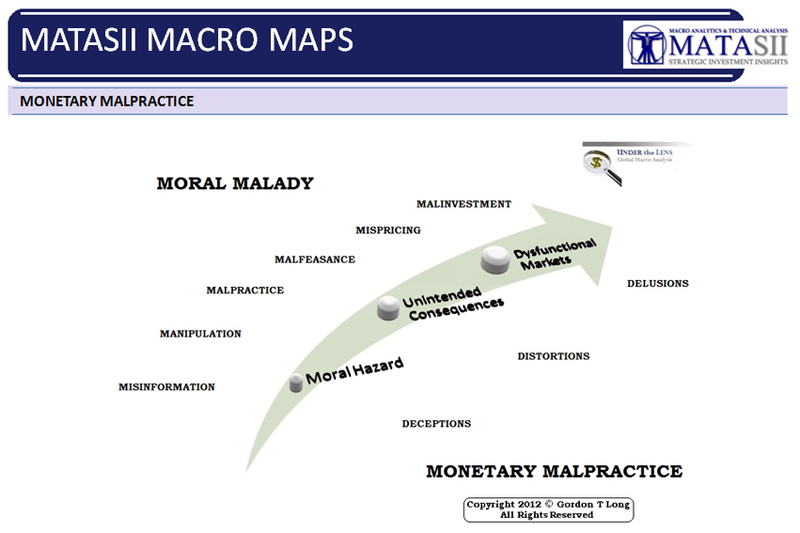 I put this road-map together in 2012 (see copyright logo) on what we should expect based on the Federal Reserve practicing policies of ZIRP and what was then a new concept - Quantitative Easing (QE1). It has proven to be prescient! Below is a long article by John Mauldin who I have interviewed for the Financial Repression Authority in 2015. I recommend you read it with a clear framework from the context of the following key points which I have pointed out many time since the publication of the road-map. 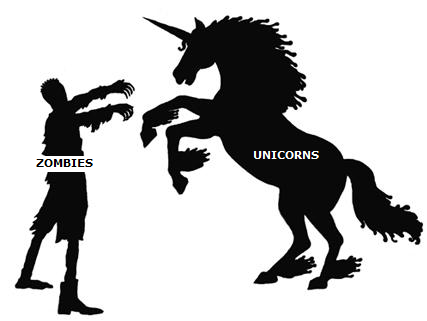 CREATIVE DESTRUCTION: So Winners will secure 'scarce' Financing and not the losers (called Zombies & Unicorns in the article below) which survive on 'easy' financing. FREE PRICING OF RISK: Must trade freely. CRONY CAPITALISM: Where "Regulatory Arbitrage" becomes a competitive weapon. GLOBAL: That is because the next recession in all likelihood will be truly global. RESPONSE: It will be the response to the last recession that makes the next one so much worse. PASSIVE INVESTING: The massive move into low-fee index investing instead of active management will make the next recession more painful. Public pensions, are heavily weighted to a form of index investing. SOURCE: 04-10-19 - John Mauldin via MauldinEconomics.com - "The Fed Has Created An Economy Of Zombies And Unicorns"
You must understand that 75% of today’s wealth is in the hands of retirees and pre-retirees. Most have a significant portion of their money in index funds, and they’re going to see significant erosion of their retirement assets. I’m thinking especially of those depending on public pensions, which are heavily weighted to a form of index investing. Public pensions are already significantly underfunded (in general) and a bear market will make them even more so. It will be painful and I can assure you it will cause a lot of political angst. Today I’ll tell you why I think this. It may be one of the more important letters I’ve written in the recent past, so read carefully. The playbook truly fell apart in 2008. The system had so much debt that adding yet more of it didn’t have the desired effect. As noted, easy money from the last crisis had created the situation. Even dropping short-term rates to effectively zero didn’t help because it was creditworthiness, not interest costs, that kept people and businesses from borrowing. The Bernanke Fed’s answer was quantitative easing—essentially a way to stimulate lending at longer maturities. It had an effect but not the intended one. Instead of going to productive use, the new stimulus helped banks deleverage and public companies leverage up and repurchase their own shares, or as we will discuss below, simply buy their competition and short-circuit the “creative destruction” cycle. This pushed asset prices, i.e. the stock market, higher and made it appear recovery was underway. Unfortunately, the “recovery” was the slowest recovery on record. The result was a massive wave of investment, some good and some, well, let’s just say based on hope and little else. And as we know, hope is not a solid investment strategy. Some businesses that had good stories (the so-called unicorns) found themselves covered with cash by investors for whom hope sprang eternal. Eager to show they could turn the cash into gold, the companies sought to emulate the Amazon model, using money to buy growth without profit. In the hopes of going public at some point and cashing in, they kept the game alive. Think Lyft. (Note: I like Lyft and wish them nothing but success. But still…) Investors, because they wanted to believe the story they were investing in was true, watched and waited. They’re still waiting. And here we are. Note, these were not startup companies. All were at least 10 years old and still in business despite their inability to make any money. Here was my conclusion at the time. Now a Bank of America Merrill Lynch study finds roughly the same thing: 13% of developed-country public companies can’t even cover their interest payments. They are either borrowing more cash to pay off previous loans, or issuing equity to hopeful (too hopeful) investors. We have another problem I also described recently: Capitalism Without Competition. A large and growing part of the economy is effectively “owned” by powerful monopolies or oligopolies that face little competition. They have no incentive to deliver better products at lower prices or to get more efficient. They simply rake in cash from people who have no choice but to hand it over. This would be impossible if we had true capitalism, at least as Adam Smith, et al., envisioned it. Even if we generously concede that some businesses really are natural monopolies, most aren’t. The industries we now see dominated by a handful of companies got that way because the incumbents found some non-capitalistic flaw to exploit. In theory, this problem should solve itself as technology and consumer preferences change the conditions that let the monopolies arise. Yet it isn’t happening. Axios outlined the problem in a recent article on farm bankruptcies. “Gumming up the economy” is a good way to describe it. Competition is an economic lubricant. The machine works more efficiently when all the parts move freely. We get more output from the same input, or the same output with less input. Take away competition and it all begins to grind together. Eventually friction brings it to a halt… sometimes a fiery one. The normal course of events, when politicians and central banks don’t intervene, is for companies to grow their profits by delivering better products at lower prices than their competitors. It is a dynamic process with competitors constantly dropping out and new ones appearing. Joseph Schumpeter called this “creative destruction,” which sounds harsh but it’s absolutely necessary for economic growth. With creative destruction now scarce as zombie companies refuse to die and monopolies refuse to improve, we also struggle to generate even mild economic growth. I think those facts are connected. Some of this happened with good intentions. Creative destruction means companies go out of business and workers lose their jobs. Maybe a new competitor will hire them eventually, but they suffer in the meantime. Politicians try to help but finding the right balance is hard. I assign greater blame to the central bankers, not just the Fed but its peers as well. For whatever theoretically good reason, they kept short-term stimulus measures like QE, ZIRP, and in some places NIRP in place far too long. The resulting flood of capital short-circuited the creative destruction process. A lot of this happens under the radar. You’ve probably seen stories about the Lyft IPO and other unicorns that will soon go public. This is news because it’s now so unusual. The number of listed companies is shrinking because a) cheap capital lets them stay private longer and b) the founders and VCs often “exit” by selling to a larger, cash-flush competitor instead of going public. An economy in which it is easier and cheaper to buy your competitors rather than out-innovate them is probably headed toward stagnation. It is almost a sidebar, but this concept of “scale” is another important point. My usually-bearish friend Doug Kass wrote this week that Amazon will be at $3,000 within a few years and $5,000 by 2025. If it was anybody but Doug Kass I would have probably ignored such massively bullish analysis. I won’t summarize his entire letter here, but the thought it triggered in me was that Amazon now has scale. How do you compete with that? I was in southern Wisconsin on Tuesday, meeting with a group of current and potential investors in biotech company Galectin Therapeutics (GALT). I have a little skin in that game, so I took a day between meetings. After dinner I was talking with some of my fellow attendees. I asked one what he did and he is in the business of trying to merge or buy his competitors. Because the world now demands that he become bigger and leaner, he has to create “scale” or die. It was in a business that I didn’t think was naturally demanding scale. But literally, how do you compete with companies like Uline and others like them? Technology and great management create scale that dominates the potential market… and make it difficult for new competition. Between technology and ultracheap money we have short-circuited Schumpeter’s creative destruction. It is like watching the small farmer disappear. Your heart is with them but the market demands scale. Can small farmers producing locally grown food survive? Absolutely. But it is a niche market, favoring entrepreneurial farmers, not the average small farmer of yesteryear. That world is gone. And as the world demands scale, cheap money helps it go even faster. Understand this: Cheap money is not going away. Neither is technology and the drive for scale. We can cheer for the “small farmer,” but the reality is that the world is moving to fewer competitors and larger businesses. And as I write that, I literally find myself sighing. I hate writing those words. But I can’t avoid reality. The world is changing and we must deal with it. You may have heard about “helicopter parents,” hovering over their children to ward off any and all threats. The problem is they keep the children from gaining independence. Similarly, helicopter monetary and fiscal policy that seeks to protect the economy can instead accomplish the opposite. Access to capital is necessary for economic growth, but free and/or subsidized capital is its long-term enemy. Managers and entrepreneurs have less incentive to innovate and operate efficiently when they can always count on another VC funding round or leveraged loan. When they don’t actually have to compete with more innovative competitors thanks to low-cost capital and their huge scale, creative destruction gets short-circuited. We no longer live in the world Schumpeter envisioned. That’s not a complaint, just reality. I am old enough to have read numerous stories lamenting the small farmer’s demise. And I sympathetically read them, agreeing it was sad, yet happily buying lower-priced food. “Scale” in so many businesses really matters. This doesn’t mean the Fed should keep interest rates extra-high. That would create different problems. The real barrier is this group of people who sit around a table in Washington and make decisions affecting the entire economy. That’s bad enough, but they do it based on incomplete data and flawed models. This is a terrible situation but here’s the worst part: It isn’t going to change. The Fed will keep manipulating interest rates downward, capital will stay cheap, businesses will keep wasting it and investors will keep believing this time is different. They’ll be partly right. This time will be different but not in the happy way they think. The result will be a US economy that increasingly resembles Japan’s… stuck in a loop, dependent on other countries over which it has little influence or control, with an economy going sideways while a demographic tidal wave strikes. Where does that lead? For Japan, it’s meant 30+ years in a holding pattern. I’m not sure the US will be so lucky. But at the very least, we’re going to see a decade of little or no growth and a whole lot of pain. Our incentive structures are now so distorted I don’t see any way out. A much bigger crisis is coming and it’s going to hurt. You can either deny it or prepare for it. I know which I’m doing.